Hello and welcome to Expert Handyman Services based at Frieston Road, Timperley. 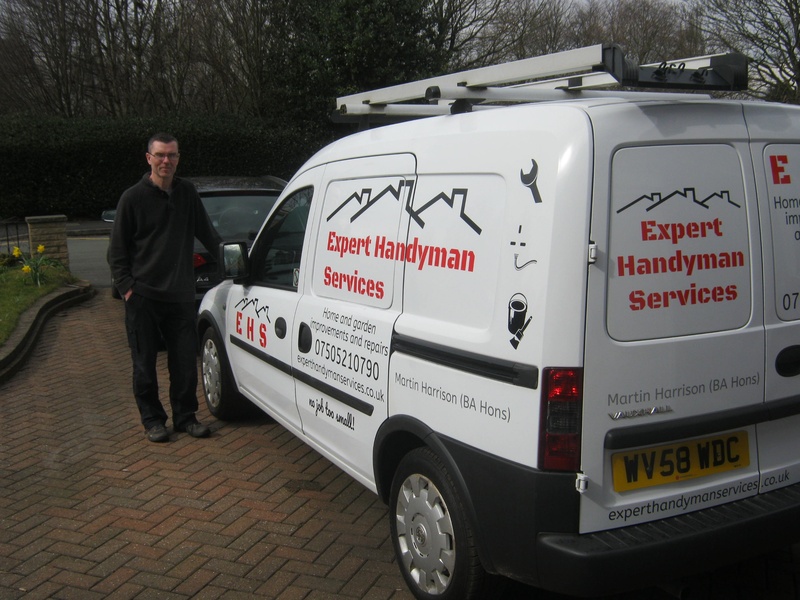 My name is Martin Harrison and I offer a wide range of maintenance services around the home - I'll happily provide a free no obligation quotation and no job is too small. After graduating from Humberside College of Art in 1990 with an honours degree (2:1) in Fine Art/painting, I have been continually expanding my creative, technical and manual skills and enjoying directing them towards my love of home design, maintenance and refurbishment. I have a broad skill base and experience in many areas including; painting and wallpapering, fitting doors and door furniture, tiling, fence repairs and fence panel installation, sheds dismantled and built, shed bases laid, picture rails/skirting boards, laminate floors, stained glass fabrication, bespoke cupboard doors, mirror and picture hanging, patio and paving- repairs relays and pointing, and many other home maintenance jobs. I also own or have access to a large array of tools, enabling me to tackle these and other less skilled jobs, for example- pressure washing, shelving, flatpacks, insulation & window and PVC cleaning. I relish solving problems and finding a way around obstacles, so bespoke jobs and jobs that require a little thinking outside the box are especially welcome, as well as work that requires a creative edge where I'm able to put my Fine Art training to use! I am a naturally conscientious and diligent worker and can guarantee my absolute focus and attention on all work I undertake. DIY is as much a hobby for me as it is a business because it's a pleasure to be involved in something I love doing. I take a pride in doing the best job I can, every time. 2018 has been my first year in business and any concerns I had initially about the phone not ringing have been well and truly laid to rest! I'm not sure whether it's my thorough and conscientious approach, or my low rates that are helping word spread (I'd like to think both!) but to say I've been busy doesn't even come close! So yes of course I want the business and welcome all enquiries, but there's a chance there may be a little waiting time before I get to you. I'm based in Timperley, and cover the South Manchester and Cheshire areas. I can often give you an estimate over the phone or provide a quote if you can email me some photos, and of course I'd be happy to pop round in person to take a look. Have a look round my website and please get in touch if you need any help or advice.